Poll: Which map layout should we use? Each of your positions are a bit wrong. Which source do you mean? My 3 main sources are all reliable. And from them I created the map. (01-17-2018, 12:01 AM)Jordonius Wrote: [...] My reasonings for the river placements was from the fact that they need to cross 2 rivers to get to mount weather from the dropship. Really? I didn't know that. That second river is maybe a newly formed river? I always thought that here was 2 rivers, but thinking about it I'm not 100% sure. The 2 rivers comes from the fact that we see a river at different times, one time Jasper gets speared but the 2 other times nothing happens. So the question is, is the river from when Octavia gets bit, Jasper gets speared and where Clarke and Finn takes swim all one and the same or 2 different ones. (01-17-2018, 12:23 AM)Boy132 Wrote: Each of your positions are a bit wrong. - could you tell me how you think they’re wrong so I can correct them? - the trikru terrain map, the original is extremely pixelated and there are many mistakes with the recreation. I think the river where Octavia gets bit and Jasper gets speared are different rivers. (the first one probably Potomac River, the second maybe Shenandoah River or a new formed river) Where Clarke and Finn take a swim is probably just a small source of water with a stream. Also there is the river with the bridge (which is also Potomac River) and the river where Lincoln took Octavia after she gets poisoned (which should also be Potomac River). You can only speculate because we have no map of the actual terrain but only from the past nuclear war. - You can see your displacements when you comepare it to my main sources or my overview. - The recreation is pretty useless, yes, but the original gives excellent information. 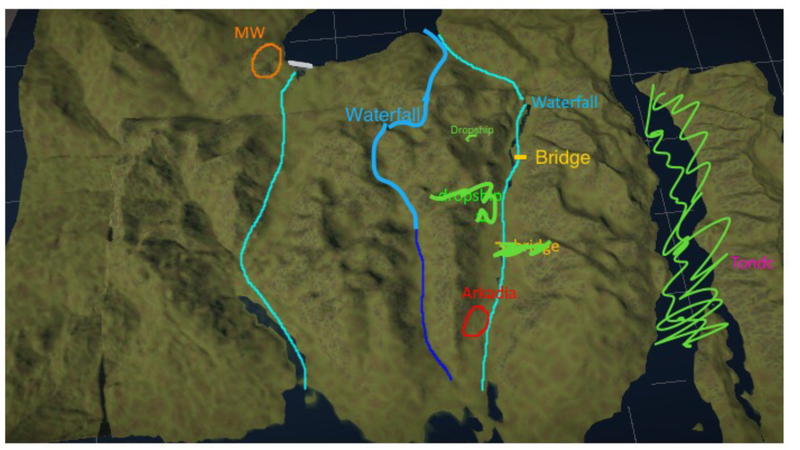 -yeah I think moving arkadia a bit and the dam to the other side of mount weather will solve that problem, as well as changing/adding some rivers. -and yeah true, though as Stephano said above I do think there are definitely at least 2 rivers/streams between the dropship and mount.weather (although I think the river Lincoln took Octavia to is closer to tondc as he carried her there and they were headed to lunas rig from the dropship. I think one of the rivers is very long, so the one Lincoln and Octavia follows is the same as one of the streams between the dropship and MW. Would make sense that the river ends in the sea. Terrain with 2 possible rivers and somewhat correct placement of the Dropship and Arkadia. Mountains between the 2 rivers will be lowered. The dropship and the bridge are way more up and the bridge is to the right of the dropship. And Arkadia is a bit too close to Mount Weather and not near a river but only near a small lake. I created an overview with all known locations from BTS maps here. The problem with your map is that it doesnt match with how the environment in the show looks at all. In the show Philpot Damn is east of MW, but in real life it's west. Also while the river is never mentioned to be near Arkadia, you would see it if they could afford drone shots of Arkadia. We can increase the distances and include a third river, so the bridge can be east of the dropship. I am someone who always wants to be very close to the original and thus becomes too perfectionist. Anyway, this map looks good. Current time: 04-25-2019, 09:43 AM Powered By MyBB, © 2002-2019 MyBB Group.